Ah the sweet joy of winning a Facebook game – I get to try out things I wouldn’t normally buy. This is my second win, which is not bad at all, considering that I don’t actually play FB games 😀 I only play when there’s no sharing involved. Anyway, in the L’Oréal Pininterest game I won four nail polishes from their Color Riche line. 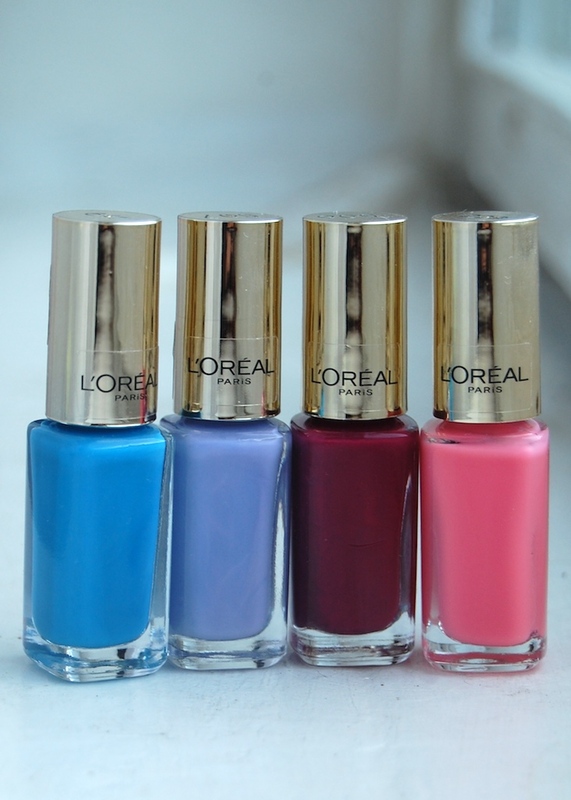 I’ve had two L’Oreal nail polishes in the past, years and years ago and those were pretty awful so I admit I was prejudiced. But very curious! Being a nail polish addict as I am, I can’t resist trying out new ones! 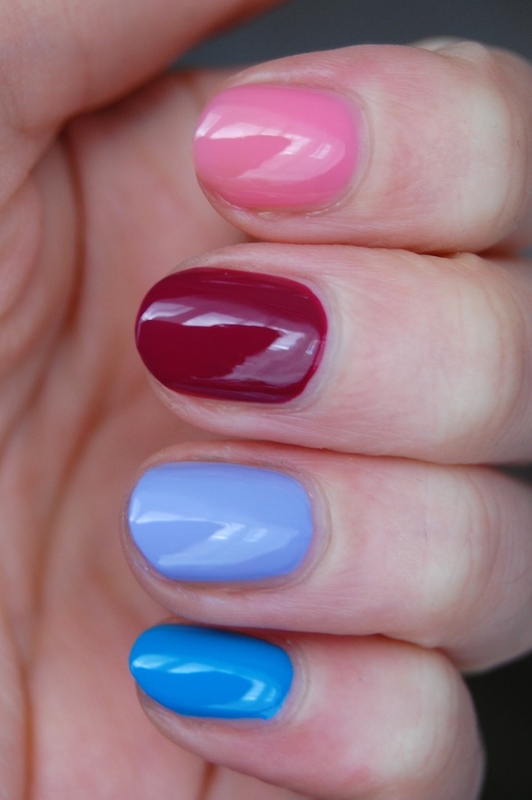 Left to right: 611 Sky Fits Heaven, 507 Riviera Lavender, 506 Exotic Grenade and 209 Ingenuous Rose. Surprisingly they’re all new colors in my collection. The lavender one is similar to the Max Factor one I swatched for you guys recently but since I gave that to my sister (she adores lavender), I’m pretty happy I got something similar. From the rest, my favorite is the Exotic Grenade, it just looks awesome with my skintone. And swatched them all for you! In one picture though, my cuticles are so messed up that they can’t take four full swatches right now. 209 Ingenuous Rose on my index, 506 Exotic Grenade on the middle, 507 Riviera Lavender on the ring finger and 611 Sky Fits Heaven on my pinky. No topcoat, 2 layers. * On the picture they have no top coat and yet they have absolutely no streaking issues whatsoever, just an even glossy surface. And this is true for ALL of them! They’re a consistent quality, surprising. Usually lavenders tend to be tricky for instance but this lavender is perfect! The pink one did differ a tiny bit, it was a bit more sheer then the others but no streaking or anything either. The only con I’d point out is that while the bottle design is gorgeous, it’s not the most practical in the sense that you have to be careful not to knock the bottle over, it tips over quite easily. I’d suggest putting it into something, I used a regular small roll of tape, just stood the bottle in the middle to give it extra stability after I almost tipped one while wiping the excess polish off the brush. Today, lets talk about the Estonian Glambox for June! The pictures are slightly… odd. 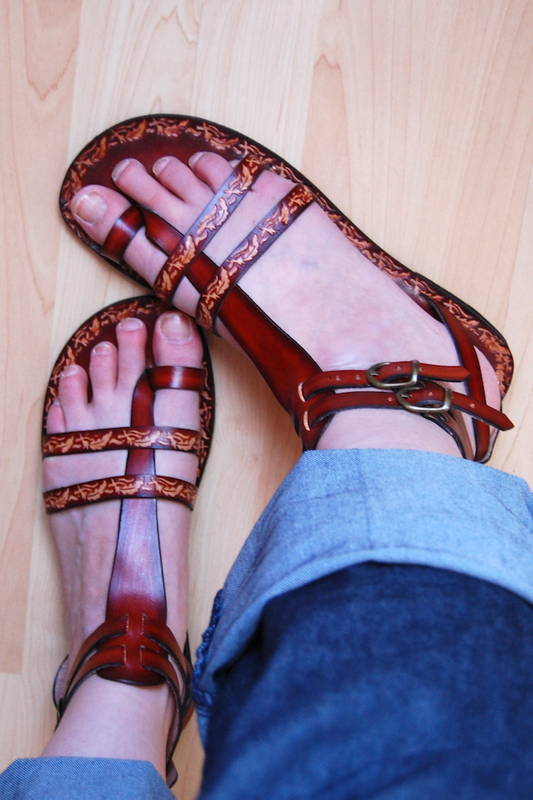 Simply because I took them in the summer house and couldn’t find a good place to take them so you’ll have to settle for summery sunshiny pictures (oh bummer XD). This is what the box looks like this month, with a pretty ribbon. 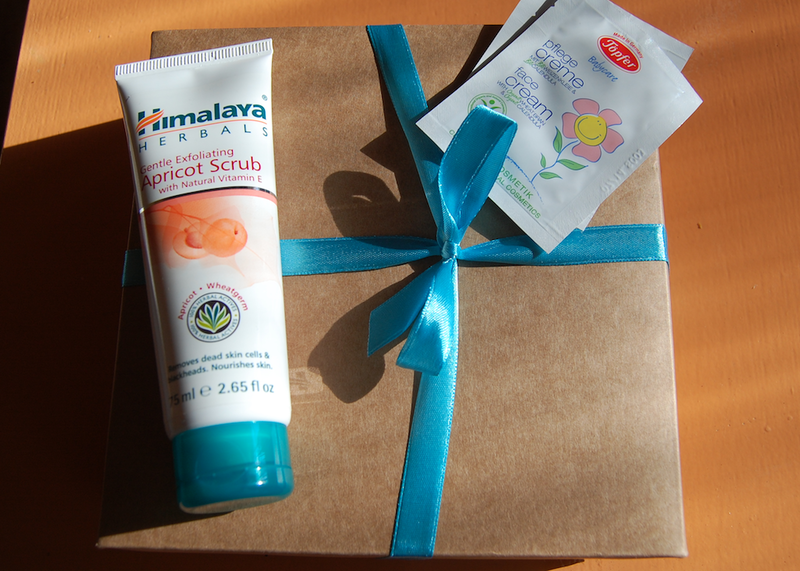 The Himalaya scrub I bought from their store because I loved the sample. It’s a really nice and affordable scrub, recommend! Sel kuul on karp selline, mulle paela värv väga meeldib 🙂 Himalaya koorija ostsin nende poest kuna mulle näidis väga väga meeldis. Tõesti hea ja samas odav ka, soovitan soojalt! Töpfer moisturizer – this was left out from my last months box so I got it now. It seems to be for babies but it says on the back that it’s ideal for adults as well. It was nice, nothing spectacular. I used one sample up but I’ll be keeping the second one for my kid to try out, she gets the most epic dry skin in the winter, maybe this will help a bit. We’ll see! I don’t want her to use stuff meant for adults, she can smear tons of chemicals on herself all her life. Right now she can do without all that. Hopefully. I don’t know the full size price of this. See jäi eelmise kuu karbist välja ja saadeti mulle nüüd. Kirjelduse järgi on mõeldud küll titadele aga taga öeldakse, et sobib täiskasvanutele ka. Proovisin ja oli täitsa okei, ei midagi rabavat. 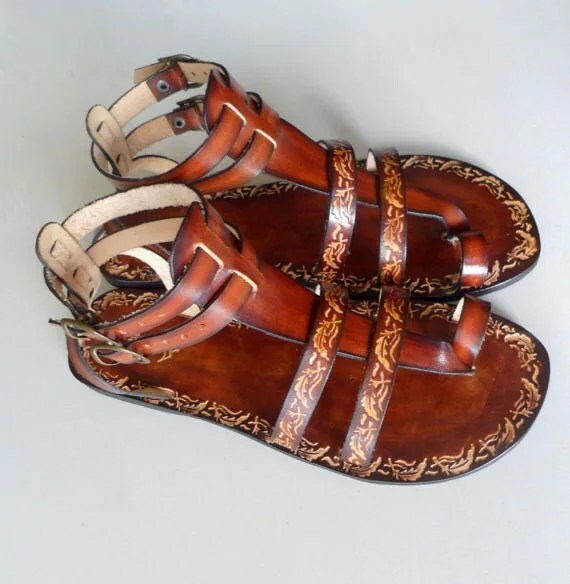 Ühe kasutasin ära, teist hoian oma tütrele proovimiseks, tal on talvel täiesti eepiliselt kuiv nahk, ehk see aitab. Täiskasvanute kraami ma tema peal ei kasuta, tonnide viisi kemikaale jõuab ta oma elu jooksul endale isegi näkku määrida, võiks alustada leebemalt. Täissuuruse hinda ei tea. Caribbean Breeze Aloe Burn Relief – this is meant for soothing sunburns, bug bites or other stuff that causes irritation, redness or pain. It has lidocaine in it so it must work. I couldn’t test it simply because I’m allergic to aloe and to me this would have ended up pretty bad. In the two weeks I didn’t find a volunteer with sunburn or bug bites either. It’s been raining so bad that all the mosquitoes are wherever they hide and so nobody has been bitten much. I am certain it would work though, lidocaine always works. Full size 250ml for 9.95€ which I think is a very nice price-amount relationship. See on mõeldud leevendamaks päikesepõletust, putukahammustusi ja mida kõike veel, mis punetab-sügeleb-valutab. Selles on lidokaiin, nii et kindlasti töötab. Mina ei saanud katsetada, ma olen aaloele allergiline ja minu jaoks oleks see pidu päris kehvasti lõppenud. Kahe nädala jooksul ei suutnud leida vabatahtlikku, kes prooviks kuna vihma muudkui sajab ja sajab ja sääsed on peidus ja päikesepõletus pole ka vihmaga kerge tulema. Aga igatahes lidokaiin koostises tähendab, et see raudselt aitab. Muud mitte, siis vähemalt valu võtab ära. Täissuurus 250ml ja hind 9.95€, väga hea hinna ja koguse suhe. L’Occitane Amande Shower Oil – oh dear Lord, the scent of it is just amazing! Seriously, I wish I could somehow magically make my blog smell of this stuff. However while it foams well and everything is nice, it leaves a sort of a film on my body which I hate. I don’t like moisturizing body washes and stuff like that, simply because I want to be squeaky clean instead of oily when I leave the shower, that’s just me. I wish it didn’t leave it, I’d love to have like a huge bottle of the stuff! Even though… wait for it… the full size is 250ml and 17.20€! Oh püha püss, kus see lõhnab hästi! Tahaks, et saaks maagiliselt oma blogi selle järgi lõhnama panna. Samas kuigi vahutab hästi ja lõhnab imeliselt, mulle üldse ei meeldinud, et jättis nahale sellise õlise kile. Mulle ei ole kunagi ükski niisutav dušigeel meeldinud, ma tahan pesemast tulles olla kiuksuvalt puhas, mitte õline. Samas paljudele just meeldib, ei pea kreemitama ja nii. Igatahes kui seda väikest asja poleks, ma ostaks suure pudeli. Olgugi, et hind on silmipimestav. Täissuurus 250ml ja hind… 17.20€. Dr. Scheller Jojoba Oil & Schisandra Smoothing Moisturizing Care – yeah. Another Dr. Scheller. And like the previous ones, this doesn’t suit me. Turns me into an oil bomb and breaks me out while at it (because it makes me that oily). Sad sad. So I don’t know. It’s certainly good for someone but not me. The scent is nice though, very mild and natural. Full size 40ml for 12€. Njah, järjekordne Dr. Scheller. Nagu eelmised, ka see ei sobi mulle, muudab mind rasvapommiks ja seetõttu tekitab mulle punne. Kurb. Ma ka ei tea, kellelegi kindlasti sobib aga mulle mitte. Lõhn on samas mõnus, pehme ja looduslik. Täissuurus 40ml ja 12€. Seebivaba igapäevaseks kasutuseks mõeldud šampoon. Noh jah. Mulle meeldis, et on looduslik. Aga muidu on šampoonidega päris keeruline, neid on raske hinnata sest tavaliselt on ikka palsam see, mis suurema vahe sisse teeb. See šampoon pesi juuksed ilusti puhtaks küll aga puhtus ei püsinud eriti kaua. RICHi šampooniga pestes ma pean pesema kaks korda nädalas. Sellega püsisid juuksed puhtad kaks ööd ja ühe päeva nende ööde vahel. Mitte just kõige mõnusam tulemus. Aga odav kraam! 200ml saab kätte 3.90€ eest. Himalaya Herbals Nourishing Skin Cream – this is a moisturizer that is meant for both face and body and says it’s non-greasy. I am pretty hesitant about things that claim to be for all my body. I mean yes, okay, there’s skin everywhere but my face is a lot more complicated then my body. I have very sensitive dry skin on my face, hands and feet but all the rest of me does just fine with pretty much no moisturizing. I do use House of Gloi pumpkin butters after every shower but it’s actually not critical that I do so, just makes me feel nice. Anyway that aside, this moisturizer was nice. And that’s it. Nothing spectacular. And it did make me a bit greasy. But yes, my skin is insane so most likely it would work just fine for most people. I do recommend you try this since you can’t beat the price. If you don’t like it, you haven’t spent a fortune. Full size 50ml for 2.95€. See kreem on mõeldud nii kehale kui näole ja väidetavalt ei ole rasvane. Ma olen üsna kahtlustav asjade suhtes, mis väidavad, et on kogu komplektile kuna okei, nahk on nahk aga mul on näonahk väga erinev kehast, mu nägu, käed ja jalad on väga kuivad aga ülejäänud keha saab vabalt hakkama ilma igasuguse kreemita. Ehkki ma kasutan House of Gloi kehavõid peale dušši aga võiks vabalt ka ilma olla. Igatahes see kreem oli päris okei, ei midagi erilist. Mind tegi küll pisut õliseks aga mu nahk on sõge ka, ma pakun, et paljudele sobiks. Ma soovitaks proovida küll kuna hind on selline, et isegi kui ei sobi, pole ka midagi hullu. Täissuurus 50ml ja hind 2.95€. Institut Arnaud Rituel Visage Exfoliating Gel – gentle facial exfoliating gel. Oddly enough there was only a teensy weensy drop in mine so there was only enough to try it out on my forehead. Seriously, there was so little of it in there. From that though, it seemed nice. There were loads of exfoliating particles that didn’t scratch my skin and my forehead felt nice after using it. However I would have liked it if the tube was full. Or at least had enough for the entire face 😀 Cause this was kind of funny. But I think that once I use my Himalaya scrub up, this may well be the next scrub I purchase. Maybe. Full size 50ml for 13.90€. Õrn näokoorimisgeel. Kummalisel kombel oli seda ainult häääästi natukene. No nii pisut, et sain ainult lauba peal proovida. Väga veider. Igatahes sellest laubakoorimisest selgus, et tegu on mõnusa asjaga, palju peeneid koorivaid osakesi, mis ei kraapinud nahka ja laup oli mõnus ja sile. Siiski oleks mulle meeldinud, kui tuub oleks täis olnud. Või vähemalt sisaldanud piisavalt, et terve näo peal katsetada. Siiski, ma arvan, et kui mu Himalaya ükskord otsa saab, siis see võib täitsa vabalt järgmine ost olla. Võibolla. Täissuurus 50ml ja hind 13.90€. Geisha chocolate – yep, as always. Nagu alati, kaasas ka Geisha šokolaad. Super Stardikas – this is a prepaid phone card. Why? I do not get it. Really. I’m obviously not in need of it, otherwise I would have bought it myself. I have a number and a contract and no need for a prepaid card. Oh well. Miks? Ei saa aru. Kui mul seda vaja oleks, ma ostaks selle ise. Mul on olemas number ja leping ning ei mingit vajadust kõnekaardi järele. Hämming. Aga okei. This was a pretty disappointing box to me. First of all they say that every month you get 2-3 full sized products. 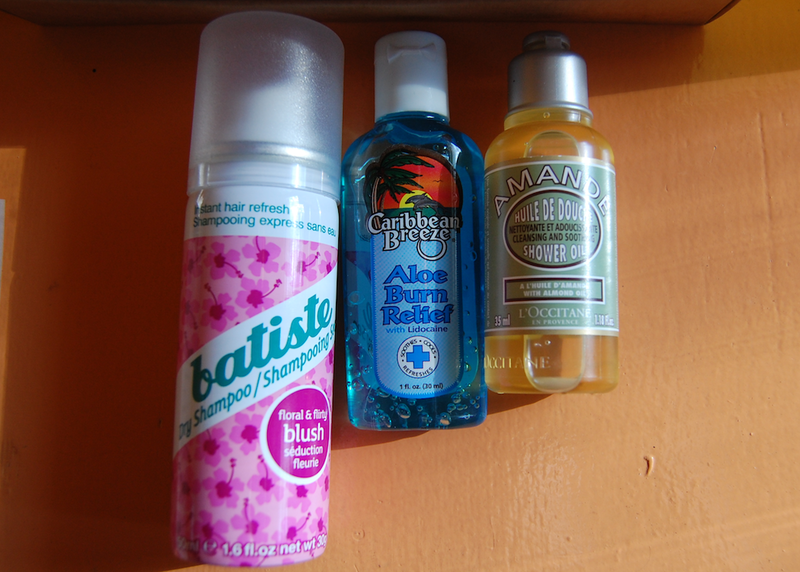 This month there was a mini version of the Batiste dry shampoo and no other full sized products. If you don’t count the prepaid card which I don’t. It did make the decision of whether to get the next months box really difficult. At first I was sure that this is it for me. But two weeks down the road I decided that maybe it was a hiccup and I’m giving it one more month and then I’ll decide whether to stop ordering it or not. And what’s up with the empty scrub? Seekordne Glambox oli üsna pettumustvalmistav. Esiteks nad väidavad, et iga kuu saad 2-3 täissuuruses toodet. See kuu oli miniversioon Batiste’i kuivšampoonist ja ei miskit muud. Kui kõnekaarti mitte lugeda ja ausalt, seda ma küll ei loe. See otsus, et kas järgmise kuu karp tellida või mitte, tuli ikka väga raskelt. Alguses olin kindel, et aitab. Aga kaks nädalat on möödunud ja leidsin, et olgu, üks kord veel. Ja siis otsustan, kas tellin edasi või mitte. Ja mis teema selle tühja näokoorijaga on? Loved the Batiste! And I love it that they’re starting to include L’Occitane. 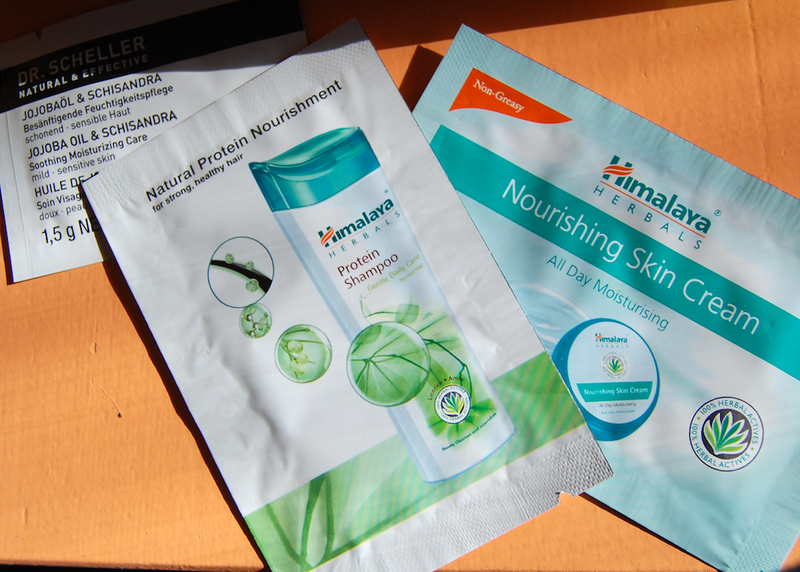 Since they tend to stick to their brands a lot (I mean Himalaya and Dr. Scheller are in every month), I’m hoping they’ll have more of their stuff next month. I’m dreaming of trying their hand cream, maybe they’ll fulfill my wish 🙂 One can hope! Hey, there are always good things too! Batiste oli äge! Ja mulle meeldib, et karpi on lisandunud L’Occitane. Kuna nad tunduvad püsivat samade brändide juures (Himalaya ja Dr. Scheller on igas karbis ju), siis loodan, et järgmine kuu saab veel nende kraami. Äkki isegi kätekreemi? Väga tahaks, ehk mu lootus läheb täide 🙂 Loota ju ikka võib! Alati on häid asju ka! Glambox Estonia. Ma ikkagi soovitan, ehkki see kuu oli, nagu ta oli. Kui kohe ei julge, soovitan oodata ja vaadata, mis järgmisel kuul juhtub, ehk läheb jälle paremaks. Mina veel alla ei anna igatahes. Ehkki kui järgmine kuu on samasugune, siis ilmselt küll. If you don’t know yet, Fantasy Fire is a mini from their Mini Effects line and on its own it’s quite unimpressive but oh man the magic if you put it over something! It’s a sheer layering polish, multichrome glitter in a purple jelly base. Amazing! In Estonia, the price was 5.50€. 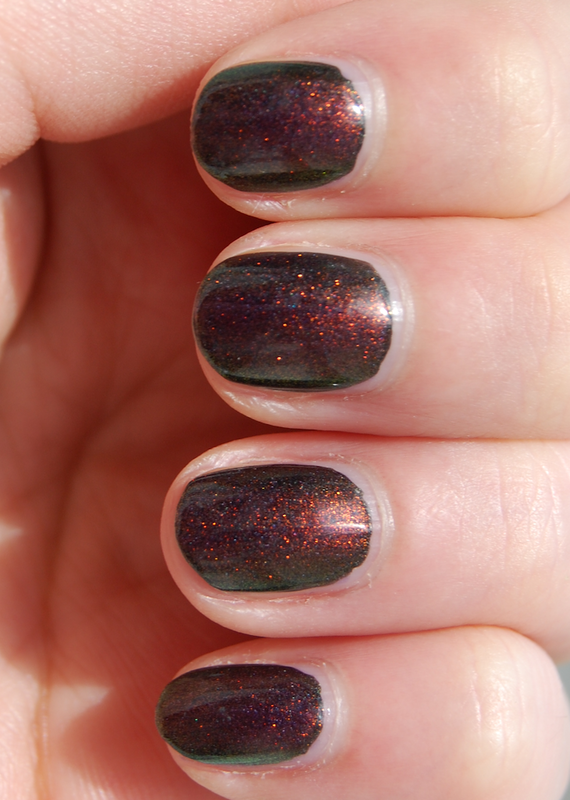 But wait, there’s a strong multichrome in play there! There’s red and purple and green and yellow and omg! 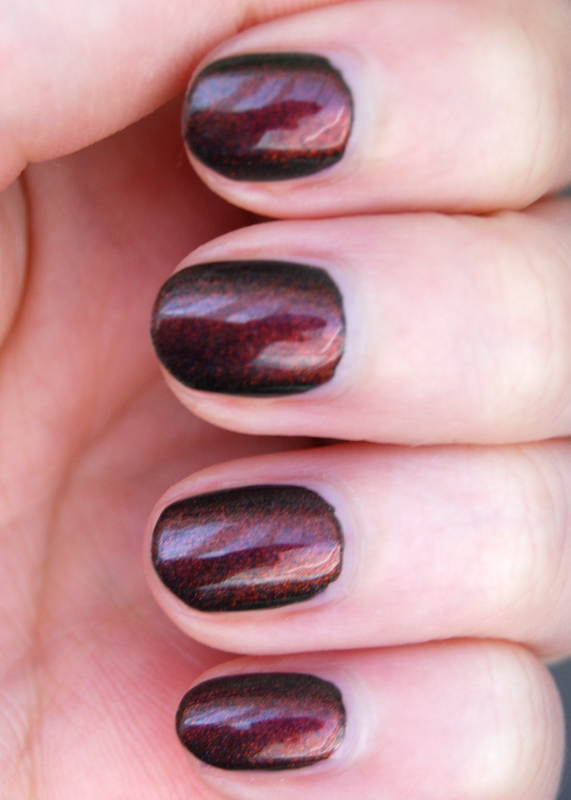 Ahh the pleasure of a gorgeous multichrome layering polish! Since the bottles are megatiny, I was smart and got a backup as well. You never know! I’ve been wearing this for a few days now and I’m more in love with it by the minute. Yay for MaxFactor bringing this gem to Estonia! I don’t know about other countries, maybe the UK-only thing is now over so do check your MaxFactor stands, maybe they’re available elsewhere too! 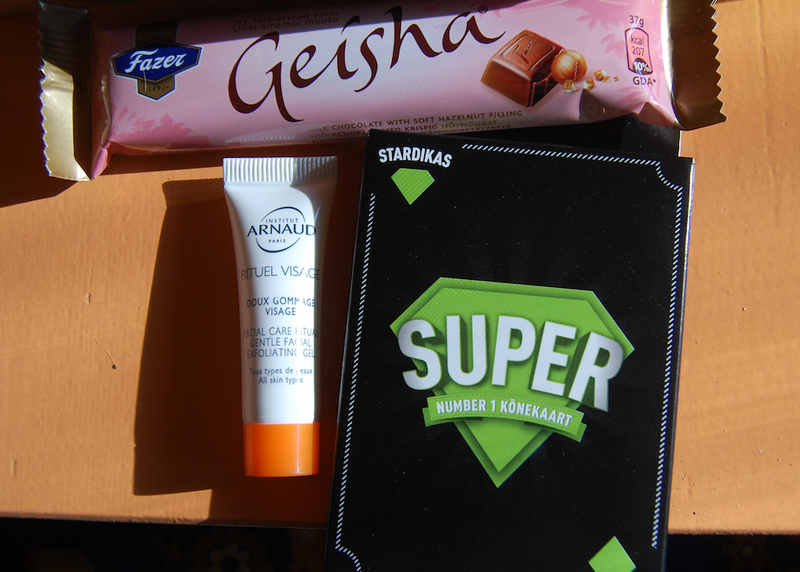 Tomorrow I’ll be back with this months Estonian Glambox! Sorry that I’ve been missing in action, summer is taking its toll on me. And I haven’t even gotten to the vacation part yet 😀 Been too busy. I will also be away most of next week so next post will be next Friday. But until then, have my nails for the day! I call this Strange Nights. 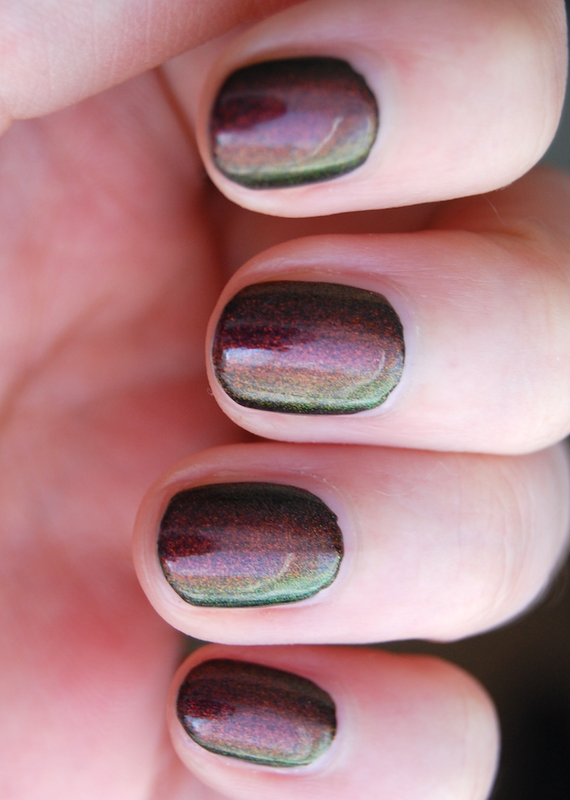 Because it’s strange and it is totally a nighttime mani. 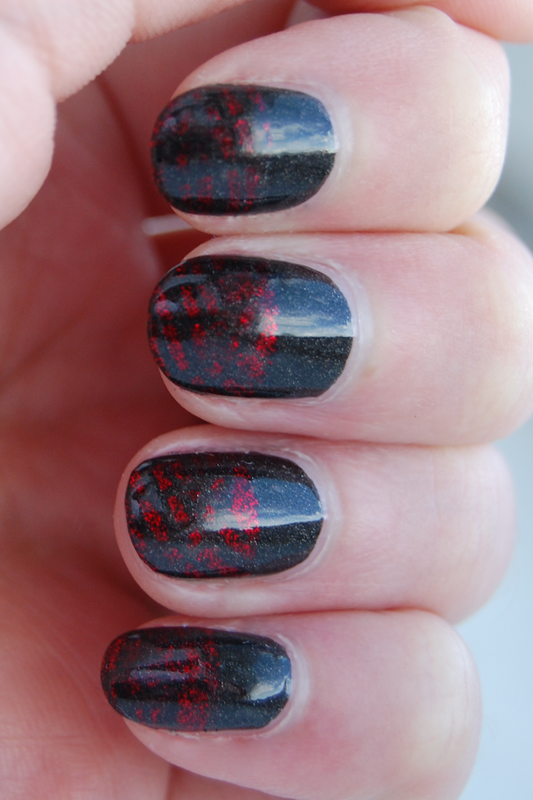 I was just testing out my first ever nail image plates, the Bundlemonster ones. And this is the result. First I painted my nails with a-england Bridal Veil (the best black holo ever), then went over the tip half of the nail with China Glaze Ruby Pumps and last, stamped the red part with Bridal Veil once more. I think it could have used a bit more contrast between the red and the black but hey, next time I’ll do better! I actually have an idea for next time which you’ll hopefully see next Sunday 🙂 And at one point I’ll also be talking more about the plates themselves. Take care everyone and see you on Friday! I have quite a bunch of stuff lined up for June, will be a cool month! So stay tuned! Happy Friday everyone! I can just feel the weekend coming! Wee! 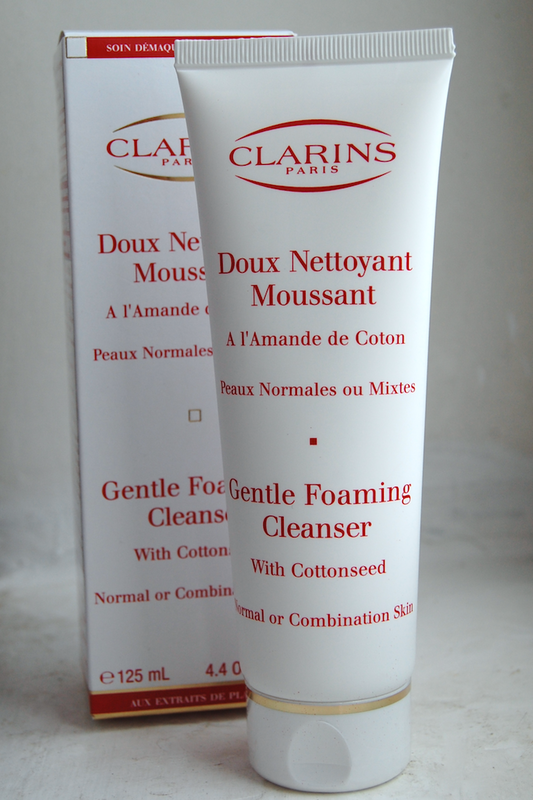 Today I want to talk about the Clarins Gentle Foaming Cleanser with Cottonseed. This is meant for normal and combination skin. However I have sensitive dry skin and this works wonderfully for me as well so I’d say it’s worth a shot even if you’re not one of the lucky ones with normal or combination skin. Clarins does have foaming cleansers meant for dry skin and oily skin as well but I haven’t tried those so can’t say much about them. The cleanser comes in a tube with a flip cap and there’s a hefty amount of it, 125 ml or 4.4 ounces, whichever makes more sense to you. You only need a pea sized amount to clean your entire face so this lasts forever and then some. I wash my face twice a day and I’m only just now running out of my first tube of this which I bought a year ago. So definitely good value for your money. I don’t have the habit of using a foundation since I had bad acne and it only got worse when I put something over it. I do occasionally use BB creams, though now I could probably do foundation as well, just haven’t gotten around to it yet. But anyway, this cleans my skin of the BB cream perfectly, I’m sure it would remove foundation just as effortlessly as well. With my dry moody skin, this is a godsend. Most cleansers leave my face feeling crazy tight and flaky and just yuck. This makes my skin squeaky clean without the feeling that my skin is going to rip. In the winter, I do have a tiny bit of tightness between my eyebrows after washing but moisturizer takes care of that immediately. 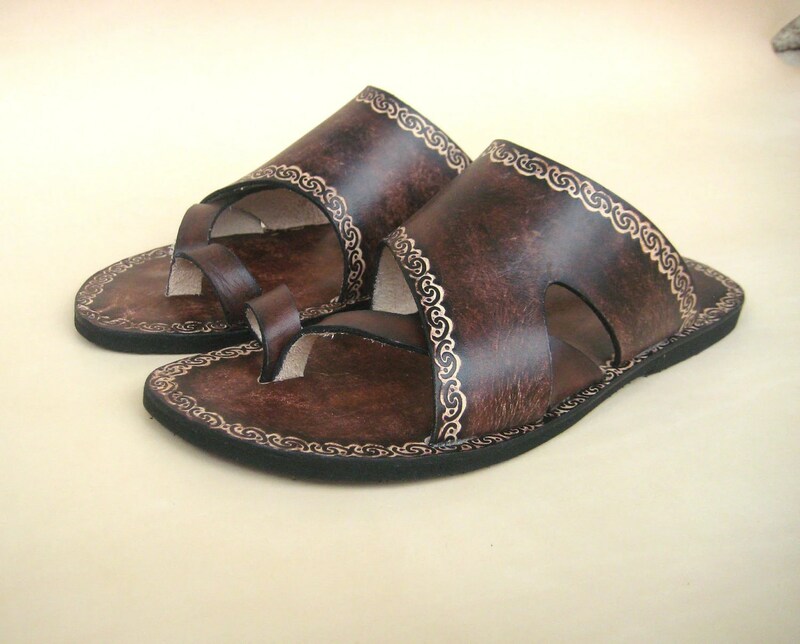 In the summer, this leaves my skin fresh and clean from the sweat and oils. It doesn’t irritate my skin at all and after switching to this, even my acne has started to become a thing of the past. So this in combination with the Paula’s Choice 2% BHA liquid has transformed my skin, I only get a tiny pimple once a month during that particular time where you may sacrifice a goat on the crossroads during midnight and you’d still get pimples. * The only con I have is that the packaging is opaque. I’d love it if it had a transparent strip somewhere so I’d see how much I have left so there wouldn’t be so much guesswork involved. Overall this is hands down the best cleanser I have ever used and trust me, I’ve tried a LOT of them. The price of this is a tiny bit spooky at first sight (around 30$, depending on where you buy it) but given that it lasts so long, it really is a worthy place to put your money. I definitely recommend trying this out! Have you tried this cleanser? What is your favorite?